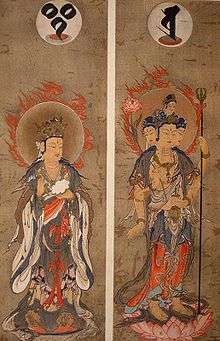 Brahmā is a leading god (deva) and heavenly king in Buddhism. He was adopted from other Indian religions that considered him a protector of teachings (dharmapala), and he is never depicted in early Buddhist texts as a creator god. In Buddhist tradition, it was deity Brahma who appeared before the Buddha and urged him to teach, once the Buddha attained enlightenment but was unsure if he should teach his insights to anyone. Brahma is a part of the Buddhist cosmology, and lords over the heavenly realm of rebirth called the Brahma-loka – the most sought after realm for afterlife and reincarnation in Buddhist traditions. Brahma is generally represented in Buddhist culture as a god with four faces and four arms, and variants of him are found in both Theravada and Mahayana Buddhist cultures. The origins of Brahma in Buddhism and other Indian religions are uncertain, in part because several related words such as one for metaphysical Ultimate Reality (Brahman), and priest (Brahmin) are found in the Vedic literature. According to KN Jayatilleke, the Rigveda expresses skepticism about major deities such as Indra whether he even exists, as well as whether the universe has any creator and can this ever be known, as evidenced in its eighth and tenth book, particularly in its Nasadiya Sukta. The late Vedic hymns had begun inquiring the nature of true and valid knowledge, empirical verification and absolute reality. The early Upanishads built upon this theme, while in parallel there emerged Buddhism, Jainism and other skeptical traditions. Buddhism used the term Brahma to deny a creator as well as to delegate him (and other deities such as Indra) as less important than the Buddha. In Hindu literature, one of the earliest mention of deity Brahma with Vishnu and Shiva is in the fifth Prapathaka (lesson) of the Maitrayaniya Upanishad, probably composed in late 1st millennium BCE, after the rise of Buddhism. The spiritual concept of Brahman is far older, and some scholars suggest deity Brahma may have emerged as a personal conception and icon with attributes (saguna version) of the impersonal universal principle called Brahman. The Buddhists attacked the concept of Brahma, states Gananath Obeyesekere, and thereby polemically attacked the Vedic and Upanishadic concept of gender neutral, abstract metaphysical Brahman. This critique of Brahma in early Buddhist texts aim at ridiculing the Vedas, but the same texts simultaneously call metta (loving-kindness, compassion) as the state of union with Brahma. The early Buddhist approach to Brahma was to reject any creator aspect, while retaining the Brahmavihara aspects of Brahma, in the Buddhist value system. Deity Brahma is also found in the samsara doctrine and cosmology of early Buddhism. Brahma (梵天) is known as Phra Phrom in Thai, Pomch'on in Korean, Fantian in Chinese, Tshangs pa in Tibetan and Bonten in Japanese. In the Niddesa, the Buddha is devatideva, the god beyond the gods including Brahma. Baka Brahmā (literally "crane-Brahmā") appears in the Majjhima Nikaya, where he is a deity who believes that his world is permanent and without decay (and that therefore he is immortal), and that therefore there are no higher worlds than his. Gold covered Phra Phrom statue at Sanggar Agung, Surabaya, Indonesia. 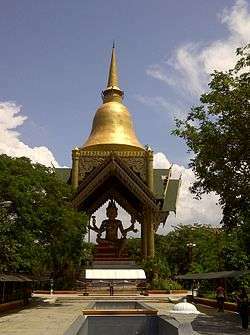 He is known as Brahmā Sahāmpati in the Thai tradition. Brahmā Sahāmpati, said to be the most senior of the Mahābrahmās, was the deity who visited the Buddha when he attained enlightenment, and encouraged him to teach the Dharma to humans. Brahmā Sanatkumāra (Sanskrit) or Brahmā Sanaṅkumāra (Pāli), the "Ever-young", appears in the Janavasabha-sutta (DN.18), where he is recalled as having created an illusionary presence to make himself perceptible to the coarser senses of Śakra and the gods of Trāyastriṃśa. The singular leading deity and the king of heavens Brahmā is sometimes referred in Buddhist texts as Mahābrahmā. However, the Suttas are inconsistent in this regard and several early Buddhist texts depict Sakra (or Sakka, Pali: Sakraya) – who is same as the Hindu Vedic god Indra – as more important than Mahabrahma. According to Martin Wiltshire, the abstract Brahman concept of the Vedic era may have been anthropomorphized by Buddhist Nikaya writers into Mahabrahma, while the Atman (self, soul) was represented as companions Devas, or brahmas. The Mahābrahmā, or the Great Brahma, states Peter Harvey, is mentioned in Digha Nikaya as the being who dwells in the upper heaven; a Buddhist student can join him for one kalpa (eon, Brahma-year in Indian religions) after successfully entering the first jhana in the form realm of Buddhist practice. In the sense of "a being of the Rūpadhātu", the term Brahmā may be related to Brahmavihāra, a term referring to the meditative states achieved through the four Rūpajhānas, which are shared by the inhabitants of the Rūpadhātu. Prior to the advent of the Buddha, according to Martin Wiltshire, the pre-Buddhist traditions of Brahma-loka, meditation and these four virtues are evidenced in both early Buddhist and non-Buddhist literature. The early Buddhist texts assert that pre-Buddha ancient Indian sages who taught these virtues were earlier incarnations of the Buddha. Post-Buddha, these same virtues are found in the Hindu texts such as verse 1.33 of the Yoga Sutras of Patañjali. According to Peter Harvey, the Buddhist scriptures acknowledge that the four Brahmavihara meditation practices "did not originate within the Buddhist tradition". 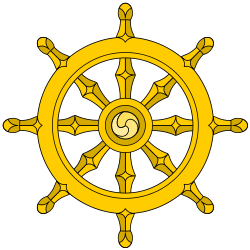 The Buddha never claimed that the "four immeasurables" were his unique ideas, in a manner similar to "cessation, quieting, nirvana". These meditation practices are named after Brahma, a god also found in Hinduism texts as well as Jainism text wherein he is equated with Rishabhanatha – the first Tirthankara in Jaina tradition. The old Upanishads mention both Brahma in the masculine gender deity "Brahmā", as well as gender neutral "Brahman" as the impersonal world principle. According to David Kalupahana, the Upanishads do not strictly distinguish between the two. In contrast, Damien Keown and Charles Prebish state the texts do distinctly present both the male deity Brahma and the abstract Brahman, however, in the Upanishads, deity Brahma is only referred to a few times. The Brahman as the eternal, absolute metaphysical reality – along with Atman (self, soul) – is the predominant and frequent teaching in the Upanishads and other Vedic literature of the Upanishadic period, so much so that early Hinduism is also referred to as Brahmanism. The Pāli scriptures, which were written centuries after the death of the Buddha, mention Brahma, but there is no unambiguous mention of the gender neuter Brahman concept. Buddhism denies both Brahman and Atman concepts in ancient Hindu literature, and posits Śūnyatā (emptiness, voidness) and Anatta (non-Self, no soul) concept instead. The word Brahma is standardly used in Buddhist suttas to mean "best", or "supreme". Brahman in the texts of Advaita Vedanta and many other Hindu schools, states Nakamura, is a concrete universal, manifesting itself as phenomenal reality which is not illusory and nondual. In the earliest Upanishad, the Brihadaranyaka Upanishad, the Absolute, which came to be referred to as Brahman, is referred to as "the imperishable". The Pāli scriptures present a "pernicious view" that is set up as an absolute principle corresponding to Brahman: "O Bhikkhus! At that time Baka, the Brahmā, produced the following pernicious view: 'It is permanent. It is eternal. It is always existent. It is independent existence. It has the dharma of non-perishing. Truly it is not born, does not become old, does not die, does not disappear, and is not born again. Furthermore, no liberation superior to it exists elsewhere." The principle expounded here corresponds to the concept of Brahman laid out in the Upanishads. According to this text the Buddha criticized this notion: "Truly the Baka Brahmā is covered with unwisdom." The Buddha confined himself to both ordinary empirical sense experience and extrasensory perception enabled by high degrees of mental concentration. The Upanishadic scholars, according to Francis X Clooney and other scholars, assert their insights as a combination of intuitive empiricism, experimentalism, and inspired creative perception. 1 2 3 4 5 6 7 Yuvraj Krishan (1996). The Buddha Image: Its Origin and Development. Bharatiya Vidya Bhavan. p. 120. ISBN 978-81-215-0565-9. 1 2 3 4 5 Robert E. Buswell Jr.; Donald S. Lopez Jr. (2013). The Princeton Dictionary of Buddhism. Princeton University Press. pp. 141–142. ISBN 978-1-4008-4805-8. ↑ Peter Harvey (2013). An Introduction to Buddhism: Teachings, History and Practices. Cambridge University Press. pp. 37–38. ISBN 978-0-521-85942-4. ↑ Robert E. Buswell Jr.; Donald S. Lopez Jr. (2013). The Princeton Dictionary of Buddhism. Princeton University Press. p. 142, Article on brahmaloka. ISBN 978-1-4008-4805-8. ↑ KN Jayatilleke (1998). Early Buddhist Theory of Knowledge. Motilal Banarsidass. pp. 24 with footnote 2. ISBN 978-81-208-0619-1. , Quote: "What evidence is there for the existence of Indra unless someone has seen him? One stanza in a hymn says, 'One and another say, there is no Indra. Who hath beheld him? Whom then shall we honor?' - Rigveda 8.100.3, in Griffith: 8.89.3"
↑ KN Jayatilleke (1998). Early Buddhist Theory of Knowledge. Motilal Banarsidass. pp. 21, 24. ISBN 978-81-208-0619-1. ↑ James Thrower (1980). The Alternative Tradition: Religion and the Rejection of Religion in the Ancient World. Walter de Gruyter. pp. 40, 43–44. ISBN 978-90-279-7997-1. ↑ KN Jayatilleke (1998). Early Buddhist Theory of Knowledge. Motilal Banarsidass. p. 24, 27-28. ISBN 978-81-208-0619-1. Quote: "Here for the first time there is an expression of doubt about the possibility of knowing certain things and a dim awareness that some sort of evidence was necessary before we can afford to make factual assertions. What evidence is there for the existence of Indra unless someone has seen him? (...)"
↑ KN Jayatilleke (1998). Early Buddhist Theory of Knowledge. Motilal Banarsidass. pp. 21, 24, 27–28. ISBN 978-81-208-0619-1. ↑ Antonio T. De Nicolás (2003). Meditations Through the Rig Veda: Four-Dimensional Man. iUniverse. pp. 68–70. ISBN 978-0-595-26925-9. ↑ James Thrower (1980). The Alternative Tradition: Religion and the Rejection of Religion in the Ancient World. Walter de Gruyter. pp. 35–46. ISBN 978-90-279-7997-1. ↑ KN Jayatilleke (1998). Early Buddhist Theory of Knowledge. Motilal Banarsidass. pp. 68, 374. ISBN 978-81-208-0619-1. , Quote: "We may conclude from the above that the rise of Buddhism is not far removed in time from, though it is prior to, the Maitri Upanishad". 1 2 Gananath Obeyesekere (2006). Karma and Rebirth: A Cross Cultural Study. Motilal Banarsidass. pp. 177–179. ISBN 978-81-208-2609-0. ↑ Rupert Gethin (1998). The Foundations of Buddhism. Oxford University Press. pp. 114–115, 125–126. ISBN 978-0-19-160671-7. ↑ Peter Harvey (2001). Buddhism. Bloomsbury Academic. pp. 261, 263–264. ISBN 978-1-4411-4726-4. 1 2 3 John Myrdhin Reynolds (1996). The Golden Letters: The Tibetan Teachings of Garab Dorje, First Dzogchen Master. Snow Lion. pp. 107–109. ISBN 978-1-55939-868-8. ↑ Lewis Hodous; William E. Soothill (2003). A Dictionary of Chinese Buddhist Terms: With Sanskrit and English Equivalents and a Sanskrit-Pali Index. Routledge. p. 180. ISBN 978-1-135-79122-3. 1 2 Joseph Edkins. Chinese Buddhism: A Volume of Sketches, Historical, Descriptive and Critical. Trübner. pp. 224–225. 1 2 Nāgārjuna; Lozang Jamspal, Ngawang Chophel and Peter Santina (Translators) (1978). Nāgārjuna's Letter to King Gautamīputra: With Explanatory Notes Based on Tibetan Commentaries. Motilal Banarsidass. pp. 42–43 with footnotes. ISBN 978-81-208-1375-5. ↑ Richard K. Payne; Taigen Dan Leighton (2006). Discourse and Ideology in Medieval Japanese Buddhism. Routledge. pp. 57–58. ISBN 978-1-134-24210-8. ↑ Richard Gombrich (2012). Buddhist Precept & Practice. Routledge. pp. 199–200. ISBN 978-1-136-15623-6. ↑ Martin G. Wiltshire (1990). Ascetic Figures Before and in Early Buddhism: The Emergence of Gautama as the Buddha. Walter de Gruyter. pp. 264–265. ISBN 978-3-11-009896-9. ↑ Peter Harvey (2013). An Introduction to Buddhism: Teachings, History and Practices. Cambridge University Press. pp. 35–36. ISBN 978-0-521-85942-4. 1 2 Martin G. Wiltshire (1990). Ascetic Figures Before and in Early Buddhism: The Emergence of Gautama as the Buddha. Walter de Gruyter. pp. 248–264. ISBN 978-3-11-009896-9. ↑ Peter Harvey (2001). Buddhism. Bloomsbury Academic. p. 247. ISBN 978-1-4411-4726-4. ↑ Harvey B. Aronson (1980). Love and Sympathy in Theravāda Buddhism. Motilal Banarsidass. p. 71. ISBN 978-81-208-1403-5. ↑ Hajime Nakamura, A History of Early Vedānta Philosophy: Part One. Reprint by Motilal Banarsidass Publ., 1990, page 136. ↑ David Kalupahana (1975), Causality: The Central Philosophy of Buddhism. The University Press of Hawaii, 1975, page 19. 1 2 Damien Keown; Charles S. Prebish (2013). Encyclopedia of Buddhism. Routledge. pp. 122–123. ISBN 978-1-136-98588-1. ↑ M. Hiriyanna (1995). The Essentials of Indian Philosophy. Motilal Banarsidass. pp. 19–21. ISBN 978-81-208-1330-4. ↑ Mariasusai Dhavamony (1982). Classical Hinduism. Gregorian University Press. pp. 51–55. ISBN 978-88-7652-482-0. ↑ Bruce M. Sullivan (2001). The A to Z of Hinduism. Rowman & Littlefield. pp. 45–46. ISBN 978-0-8108-4070-6. ↑ Junjirō Takakusu (1998). The Essentials of Buddhist Philosophy. Motilal Banarsidass. pp. 13–14. ISBN 978-81-208-1592-6. ; Quote: "In very few words, Brahmanism, the old Indian religion, was a pantheism with Brahman (the eternal, absolute, unchanging principle) as the first cause of the universe. The manifestation of this Brahman is sometimes personified and is called Brahma (god, or the great self). Every human being has atman (little self). Brahman and atman are one, and of the same substance. Brahmanism, therefore, is an effort to seek the ultimate principle, Brahman, by studying one's Self, atman. The Buddha denied the existence of Brahman and atman and advanced a new theory of anatman (no-self)...."
↑ Dale Mathers; Melvin E. Miller; Osamu Ando (2013). Self and No-Self: Continuing the Dialogue Between Buddhism and Psychotherapy. Routledge. p. 81. ISBN 978-1-317-72386-8. ↑ Steven Collins, Aggañña sutta. Sahitya Akademi, 200, page 58. ↑ Peter Harvey, The Selfless Mind. Curzon Press, 1995, page 234. ↑ Karel Werner, The Yogi and the Mystic: Studies in Indian and Comparative Mysticism. Routledge, 1994, page 24. ↑ Hajime Nakamura, A History of Early Vedānta Philosophy: Part One. Reprint by Motilal Banarsidass Publ., 1990, pages 137-138. "It has the dharma of non-perishing" is Nakamura's translation of "acavanadhammam". David Kalupahana, Causality: The Central Philosophy of Buddhism. The University Press of Hawaii, 1975, page 185. ↑ A.K. Warder, A Course in Indian Philosophy. Second edition published by Motilal Banarsidass Publ., 1998, page 81. ↑ Francis X Clooney (2001). Robert C. Neville, ed. Religious Truth: A Volume in the Comparative Religious Ideas Project. State University of New York Press. pp. 53–54. ISBN 978-0-7914-4778-9.